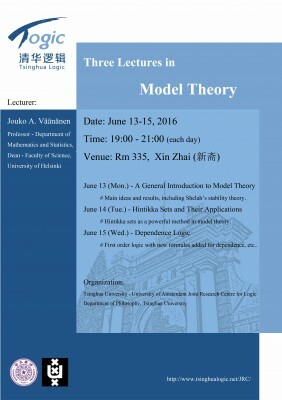 Venue: Rm 335 XinZhai (新斋), Tsinghua University, Beijing. The lecturer will give an introduction to the main ideas and results of model theory, including Shelah’s stability theory. The lecturer will tell what Hintikka sets are and how they can be used as a powerful method in model theory to prove e.g. the Compactness Theorem, Completeness Theorem and the Interpolation Theorem. Dependence logic arises from first order logic when new atomic formulas are added, e.g. for dependence, independence or inclusion. The lecturer will give the basic ingredients necessary for the study of dependence logic.